The Senate President, Dr. Bukola Saraki, has told Russian parliament that Nigerian music stars: Davido, Tiwa Salvage, Timaya. Wizkid and others will soon takeover the music industry in the country as they have done in other nations. He said that the entire Nigerian nation is with the Super Eagles who are in the country for the 2018 World Cup. 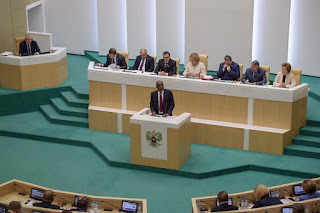 Saraki addressed the Federal Assembly of the Russian Federation at the invitation of the Chairperson of the Federation Council, Valentina Matviyenko on Wednesday morning. The Senate President on Tuesday led a Senate delegation on a three day parliamentary visit to Russia, aimed at deepening legislative best practices and further strengthening the relationship between both countries. Speaking on the Super Eagles, the Senate President said, “ In sports, well, please allow me to say humbly, that it will be difficult to take your eyes off Nigeria during the ongoing World Cup tournament. If anything, we have already won the battle of the football jerseys; the Super Eagles kit is an instant classic, a coveted collector’s item, universally acclaimed as the best national kit in Russia 2018. Saraki further gave reasons Russia should reckon with Nigeria, adding that the West African country has the second largest film industry in the world, adding,“Our position, therefore, is simple: those who are serious about expanding their interests in Africa must necessarily see Nigeria – the powerhouse in the region – as the gateway to the continent… Russia should reckon with Nigeria as the central area of focus in Africa, and take a more serious view of its longstanding ties to our end of the world. “Our two countries share certain, striking similarities. Our two nations are among the 10 most populous countries in the world; and are among the Top 10 in gas reserves. With a population of nearly 190 million people, Nigeria is set to surpass the United States of America as the third most populous country in the world by 2050. “In terms of diversity, Russia at 190 ethnic groupings is not too far behind Nigeria’s 250… With Russia and Nigeria projected to be the biggest economies in Europe and Africa respectively in just three decades from now, it would be a travesty if we did not strive to strengthen cooperation and partnership to reap the gains in terms of GDP growth.